Supporting kids and their families in the early years is critical—our future as a nation depends on it. Every child in America should have the opportunity to develop socially, emotionally, physically, and cognitively to the best of his or her ability. 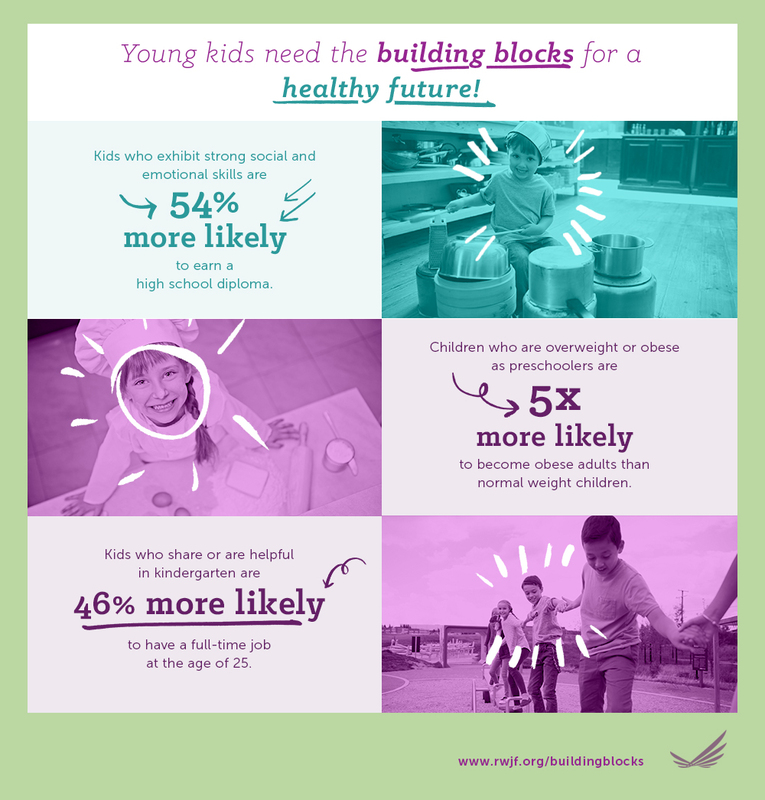 A critical part of building a Culture of Health is supporting the building blocks for a healthy start in life—social-emotional learning and healthy weight—that give kids everywhere the opportunity to live the healthiest life they can. This requires greater collaboration among parents, educators, business leaders, government officials, health care professionals, and nonprofits to create nurturing, healthy environments that support the whole child. Jones, Damon E., Greenberg, Mark, and Crowley, Max. Early Social-Emotional Functioning and Public Health: The Relationship Between Kindergarten Social Competence and Future Wellness. American Journal of Public Health, November 2015, Volume 105, Number 11, pp. 2283–2290. Schubert Kristin B., and Marks James S. The Cost of Poverty and the Value of Hope. Academic Pediatrics, Volume 16, Issue 3, pp. S21–S22. By addressing the needs of the whole child—physical, social, and emotional—adults can give children in their lives the building blocks for lifelong health and success. A series of resources focuses on the importance of supporting children’s social and emotional development so that they can lead healthier, more successful lives. RWJF's Kristin Schubert discusses a poll illustrating the challenges that parents face in accessing quality, affordable child care, and the opportunities for improvement. A 20-year retrospective study suggests that kindergarten students who are more inclined to exhibit “social competence” trait may be more likely to attain higher education and well-paying jobs. We need to ensure that all children get a healthy start to life and can reach kindergarten at a healthy weight. The nation is already making progress to promote healthy eating, encourage physical activity, and provide access to mental health care. Groundbreaking research finds that the social skills a child exhibits in kindergarten are linked to their health outcomes in early adulthood.